In 2010, a group of Faith Church members interested in organic gardening converted a portion of the church grounds into a Community Garden with 12 plots defined by cinder blocks. Individuals from the church and area neighborhoods tend their own plots using organic gardening and water conservation practices. 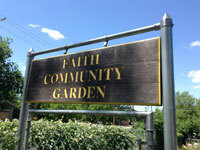 They are encouraged to contribute a portion of the garden yield to the Faith Food Pantry. A nominal monthly fee is charged ($3-5) to cover water costs. For information on plot availability, contact Lynn League at lleague67@gmail.com. We celebrate SCOTUS valuing women's rights.